This instrument has the customary shape of a nocturnal, but in fact comprises several instruments. With one side the time can be discovered at night with a nocturnal, but some of the same scales are used in a volvelle for finding the age of the moon at any date. The other side has a Regiomontanus-type sundial for finding the time during the day. 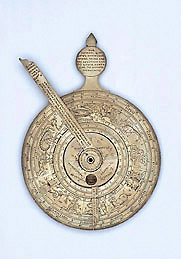 A similar instrument is to be found in the British Museum, London (Epact 53179).